Qualitative Reasoning, Dimensional Analysis and Computer Algebra. (com Waldir L. Roque), In: Proceedings of the ISSAC '91 – International Symposium on Symbolic and Algebraic Computation, Bonn, 15 a 17 de Julho de 1991. Qualitative Reasoning about physical processes has become very important in various applications involving modeling, design and simulation of devices. Many approachs to qualitative reasoning about physical processes have appeared in the literature of artificial intelligence (AI). Among them, we can cite Naive Physics, Qualitative Process Theory, Qualitative Physics based in Confluences and Qualitative Simulation. 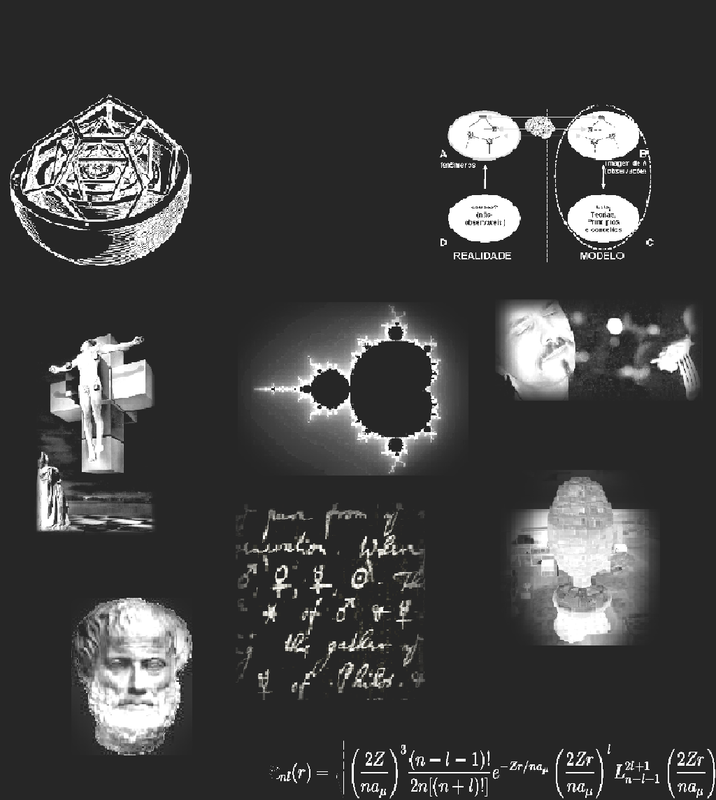 More recently, the Theory of Dimensional Analysis (TDA) has been applied as a supporting technique to Qualitative Reasoning about Physical Processes. The main works in this direction have been forwarded by Kokar, and in a much formal and systematic approach by Bhaskar and Nigam. The intention of this short progress report is to give an account of a system, in development, which is being particularly designed to compute all the relevant informations to qualitative reasoning about physical processes through the intra and inter-regime analyses obtained from dimensional analysis. BHASKAR, R. and NIGAM, A. Artificial Intelligence, 45, 73-111, 1990. BRIDGMAN, P. W. Dimensional Analysis, (Yale University Press, 1922). BUCKINGHAM, E. Physical Review, IV, 345-376, 1914 and Nature, 96, 396-397, 1915. FORBUS, K. D. Artificial Intelligence, 24, 85-168, 1984. FOURIER, J-B. Théorie Analytique de la Chaleur. (Gauthier-Villars, Paris, 1988). HAYES, P. J. In: Expert Systems in the Micro Eletronic Age, ed. D. Michie (Edinburg University Press, 1979). HEARN, A. C. REDUCE 3.3 User's Manual. The Rand Corporation, Santa Monica, CA, (1987). de KLEER, J. and BROWN, J. S. Artificial Intelligence, 24, 7-83, 1984. KOKAR, M. M. Machine Leraning, 1, 403-422, 1986; in Proceedings of AAAI - 1987, 616-620. KUIPERS, B. J. . Artificial Intelligence, 29, 289-338, 1986. RAYLEIGH, L. Nature, 96, 66-68 and 644, 1915. RIABOUCHINSKI, D. Nature, 96, 591, 1915. 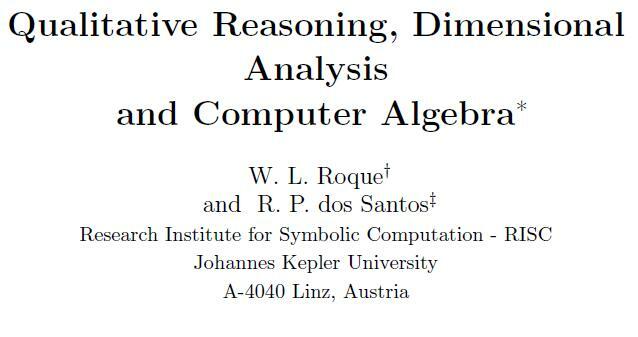 ROQUE, W. L. and dos SANTOS, R. P. Preprint of CBPF NF-058/89 and Journal of Symbolic Computation, v. 12, n. 3, pp. 381-389, Sep. 1991.
dos SANTOS, Renato P. . In Física Interessante. 9 Nov. 2014. Disponível em: <>. Acesso em: .